As a eurozone summit begins today, prior talks in Paris between the eurozone “big two”, where it was hoped that a Franco-German deal might be struck, failed to bridge the gulf between Angela Merkel and Francois Hollande over the balance between austerity and growth. Germany flatly ruled out any pooling of eurozone debt in response to the single currency crisis. Merkel sharply criticised a seven-page blueprint drawn up by four senior EU leaders on opening the way to a eurozone political federation. She made it clear she would not yield to pressure to move towards the common issuance of eurozone debt in the form of eurobonds, to lower the cost of borrowing for vulnerable countries such as Spain and Italy. The Italian government is to lend the world’s oldest bank up to €2bn in the first move of its kind in Italy since the onset of the eurozone debt crisis more than two years ago. Mario Monti’s government announced on Tuesday that it would buy up to €2bn in bonds from the Monte dei Paschi di Siena (MPS), Italy’s third-biggest lender. A statement said the cabinet had decided to approve the initiative so that MPS, which was founded in 1472, could meet a 30 June deadline to bolster its finances imposed by the European Banking Authority. Spain and Italy were mired in financial woes again on Tuesday after borrowing costs jumped, stock markets fell and local politicians warred with each other over who is to blame for the financial crisis. Spanish borrowing costs jumped following the government’s application for a €100bn eurozone rescue facility to prevent the country’s banks going bust. A German courts has ruled to effectively outlaw the circumcision of boys after a judge deemed that the religious practice amounted to bodily harm. A judge at a Cologne court said that the circumcision of minors went against a child’s interests because it led to a physical alteration of the body, and because people other than the child were determining its religious affiliation. Russia has condemned a US Senate committee’s approval of a bill that would ban officials accused of human rights abuses from entering the United States. On Tuesday, the Senate’s foreign relations committee unanimously passed a bill named after Sergei Magnitsky, a young lawyer who died in jail in 2009 after uncovering an alleged corruption scheme involving Russian tax officials and police. The bill, put forward by Senator Benjamin Cardin, would ban officials allegedly involved in Magnitsky’s death from entering the US, and impose restrictions on their financial activities inside the country. Turkey’s prime minister, Recep Tayyip Erdoğan, has threatened Syria with retaliation for the shooting down of a military jet, and warned that Turkish armed forces would respond to any Syrian encroachment on their joint border. Erdoğan described the downing of the reconnaissance plane on Friday as a deliberate and hostile act that would not go unanswered. Silvio Berlusconi appears to be planning a political comeback, and could return to lead the right into an early general election, perhaps as standard-bearer of a party bent on withdrawing Italy from the euro. Mr Berlusconi remains a defendant in two trials, both taking place in Milan. In one he faces tax-fraud charges relating to an earlier period in his TV business affairs. Earlier this month, the prosecutor Fabio De Pasquale called for the three-time Prime Minister to get three years and eight months in jail for his part in the alleged plot to create overseas slush funds with money saved by tax-dodging. The next hearing is set for early July. The new Greek prime minister, Antonis Samaras, who underwent eye surgery on Saturday, will not attend a key summit of EU leaders this week, when Athens will seek to ease the terms of its international bailout. The Greek government said it would press for an extra two years’ grace to meet the tough deficit targets laid down in the bailout deal, and was hoping to reverse cuts in the minimum wage and cancel planned civil service layoffs. The incoming finance minister, Vassilis Rapanos, will also miss the summit having been rushed to hospital on Friday before he could be sworn in, complaining of nausea, intense abdominal pains and dizziness. He remains in hospital. Bosnian Serb war crimes suspect Radovan Karadzic is due to hear whether his request to have his case thrown out has been successful. Karadzic is on trial in The Hague and has asked to be acquitted on the basis that prosecutors had failed to provide enough evidence. He is accused of ordering atrocities during the Bosnian war in the 1990s. He denies the 11 charges of genocide, war crimes and crimes against humanity. Germany has upset animal rights activists with its latest attempts to predict the outcome of Euro 2012. 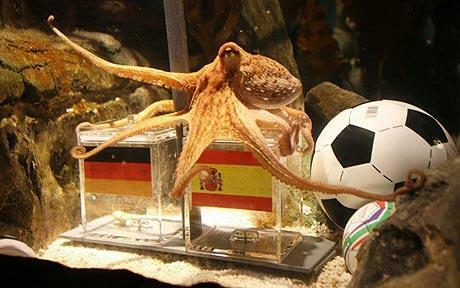 Two years after the death of popular pundit Paul the octopus, a range of pets are now being deployed to “predict” which football team will win. However, Yvonne the cow, Kasimir the alpaca and Xaver the bulldog have upset German animal rights activists. The country’s Tierschutzbund group said it was worried animal oracles had been overused during the tournament. Television and radio stations across the country have been employing animals to predict results in the tournament, with varying degrees of success. The financial crisis in Europe may have brought out the worst in certain bankers, but it seems to be bringing out the best in Italy’s police. On Tuesday, and for the second time in less than a month, officers called to deal with a shoplifter were reported to have taken pity on the alleged thief and paid for the goods out of their own pockets. This entry was posted in Current Events, News, News Roundup by eutopialaw. Bookmark the permalink.